Laws banning the flying of national flags without a vertical pole are set to be scrapped. BBC News considers the nation's changing relationship with flags. Before the inevitable capitulation in a penalty shoot-out, a simple measure of the nation's optimism about England's chances of winning the World Cup was the ubiquity of the St George's Cross flag. Pieces of cloth bearing the emblem adorned houses, flags and cars nationwide. The practice even extended to the political world. Culture Secretary Tessa Jowell had two England flags attached to her official vehicle during the World Cup and a St George's Cross was raised in Downing Street on England match days. Tony Blair said it would have been "completely absurd" not to show his support for England by flying the flag. Meanwhile, Conservative leader David Cameron was seen with a St George's Cross flag fluttering from his bicycle. But what has changed? When and why did flags become fashionable? "People are becoming more adventurous - they want to be display their sense of identity," says Charles Ashburner, owner of mrflag.com, by way of explanation. "It is a lot more acceptable now to fly the St George's Cross and Union Jack. It is part of a greater trend towards people wanting to have a flag identity that wasn't the case five years ago. "Flying a national flag is common in the US and Scandinavian countries, but we've only started seeing it here recently," he says, adding that changes to the law are likely to make their use more widespread - a point that is made by a number of retailers. 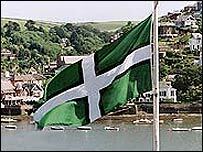 Mr Ashburner points out that county flags - such as ones for Devon and Cornwall - are increasingly popular, adding that there are plans for new flags to represent Somerset and Lincolnshire. 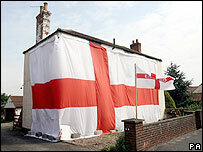 "Not everybody wants to fly the Union Jack or, in England, the St George's Cross. In the last ten years there has been a rash of new flags. And the internet has helped as it has enabled people to find the exact flag that they want to represent them. "People want something that symbolises where they are from. It's like supporting a football team. People are different and want to show this - the England flag doesn't point to the differences between someone from the North East and someone from the south coast." And these observations are largely shared by other flag retailers and manufacturers. Graham Wilkinson, managing director of Hampshire Flag Company, says he has seen sales of England flags increase by around 300% since 2003, although Union Jack sales have not risen by as much. And is not just an English phenomenon. Eclipse Flags, which is based in Essex, has seen marked rises in sales of Scottish and Welsh flags. Chris Roberts, who works in sales and marketing at the firm, says there has been a recent spate of orders from Welsh companies in particular. And explaining a new trend that goes beyond the practice of regional flags, he says: "We're also seeing a lot of demand for bespoke flags. People are ordering flags of their own design. "Changes in the printing industry and the use of digital photography is making it easier to make whatever you want. "Flying an image on a wedding or anniversary is a great way to advertise your feelings." But not everyone has seen a boom in flag sales. Indira Bhurruth, who manages Wales Direct, says she has seen a fall in the sale of Welsh flags. But she stresses that this is unlikely to be linked to any fall in patriotism as she points out that the firm is selling more face paints with stencils in the form of the Welsh dragon. "People are choosing alternatives," says Ms Bhurruth, adding that the proliferation of shops and websites selling Welsh flags may have affected her shop's sales. But there may be another explanation for this trend. Again, pointing to the practice of flying regional and bespoke flags rather than national images, Mr Ashburner said many Welsh people fly flags featuring the Cross of St David, or the flag of Owain Glyndwr. In Scotland, people can choose to buy the Saltire with its St Andrew's cross or the Royal Standard of Scotland, although it is a criminal offence to fly the latter. "People are more cautious about the flags they fly in Northern Ireland," he adds. And, just as laws banning the flying of national flags without a vertical pole are set to be scrapped, Mr Ashburner predicts there may be another twist in the nation's new love affair with flags. "As a country we're quite new to showing our national allegiance. Other nations are used to wearing their hearts on their sleeves - but we're heading towards that point." He says our habits are changing rapidly, pointing out that draping an image from a window is not commonplace and flying a flag on a car, for example, is a relatively new phenomenon. "In the around two or three years there will be a greater proportion of people with poles they can put outside their front door so that they can raise their flag whenever there is a sporting event or some other occasion they wish to celebrate." Proud patriots or just football fans?